Rock Climbing is a great full body workout that requires core, upper body, and lower body strength as well as mental prowess and balance. Rock Climbing is a great way to workout and have fun! What are you waiting on? Come and climb with us! Ready to climb regularly? You can purchase semester passes to make your climbing more cost-effective. We sell gear passes and climbing passes; get more details on the Prices tab. 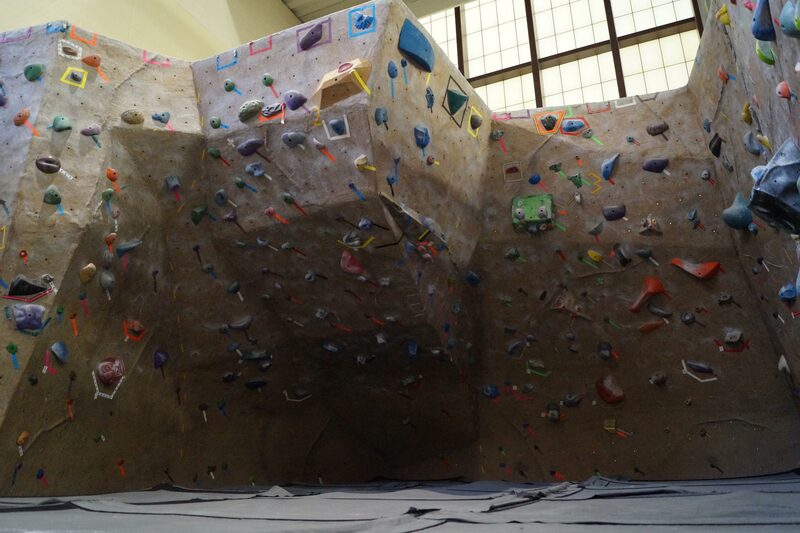 The Indoor Climbing Facility includes both the climbing tower and the Bouldering Wall. The 44-ft. high tower has approximately 3,500 sq. feet of climbing area which combines both integral rock and moveable hand and foot holds. The tower hosts 13 top-ropes and 3 auto-belay stations and offers lead climbing opportunities on 11 bolt lines. The ICF is open 7 days a week during the regular semester (with the exception of holidays). If you know how to belay, you only need a skills check to get started. Skills checks are renewed each semester and are performed whenever the ICF is open for business. If you have never climbed before, you’ll need to sign up for one of our classes to get you started. Our orientation classes are taught Monday through Friday at 5pm and 8pm. Just sign up at the ICF desk 15 minutes prior to class. If you don’t own your own equipment, you can rent ours. The Bouldering Wall is open any time the building is. You only need to drop by one of the desks in the Rec Center to sign a waiver and watch an informational video to get started. A complimentary wristband will be issued to you once you are cleared to boulder. Boulderers need to show this wristband while using the bouldering facility. Rules and regulations for the climbing facilities can be found here. Non-members turn in forms below to Outdoor Adventures Staff. If you’re looking for part-time, student employment and love the outdoors, check out our job openings on the employment page. Beginning in the Fall of 2018, lead belaying will be required to be performed with a Gri Gri Plus device which will be provided complimentary with the checkout of a lead climbing rope. ***No refunds on unused passes. Only good for semester purchased. The ICF is available for reservation for private events including birthday parties, Girl and Boy Scout groups, Corp Units and student organizations. Contact Jason Kurten at jkurten@rec.tamu.edu for more details. Reserving the ICF is the perfect option for groups larger than 5 people that would like to climb together without becoming registered climbers. These private group sessions last from 2-1/2 to 3 hours and are normally set up when the wall is closed for business. *Changes in university policy regarding facility reservations by groups or individuals not affiliated with Texas A&M University have recently been implemented. Please call 979-862-1999 for more information. If one-on-one time with one of our instructors is something you desire, we can set that up. Simply click HERE to fill out and submit the questionnaire to get started. Our experienced staff can start you off from scratch or build on your existing climbing skill set. We are able to arrange private, small group sessions for 3 or more people to learn a specific skill or introduce a new topic. Frequest sessions requested are Lead Climbing Clinics and Kayak Roll Teaching Sessions. Simply click here to fill out and submit the questionnaire to get started. For a small monthly fee, we will allow a parent and child team to come in and use the ICF on a limited basis. Parents will be instructed on how to safely belay their child. Kids ages 14 and up will be allowed to belay for one another after receiving belay training. All gear rental is included in the price and if you have an extra child, or if the parent wants to climb, we can add that on.